This is a Racer Display Stand for Pinewood Derby Cars from Pine Car. Retail $6.99 SAVE 25% ! Peserves Pinewood Derby cars in trophy-like splendor after the race. 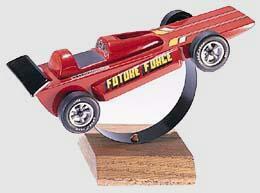 Sleek metal bracket holds any Pinewood Derby car and mounts on a solid oak base. One Racer Display Stand for Pinewood Derby Cars.